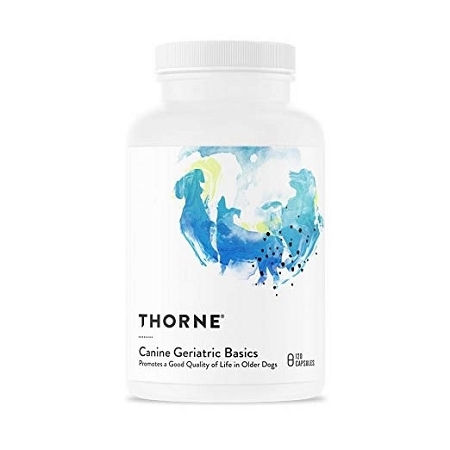 Home > Misc > See All Products > See All Dog Products > Vitamins for Dogs > Thorne Research Canine Geriatric Basics - Multivitamin for Dogs - 120 ct.
Canine Geriatric Basics - new look! 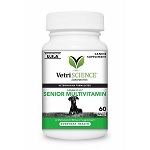 Supports healthy aging including vision & musculoskeletal support. Potent antioxidant support. Maintains healthy cognitive function. 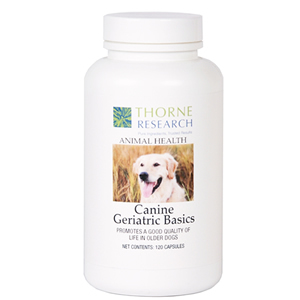 Canine Geriatric Basics contains vitamins, herbs, amino acids and other nutrients to support an older dog's immune system, vision, adrenal glands, cognitive abilities and more. 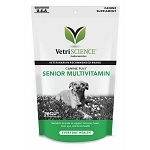 What sets this formula apart from other vitamins for older dogs are the unique herbal extracts that provide benefits not found in ordinary supplements. Ashwaganda extract is a powerful adaptogen which also has anti-inflammatory properties. It supports cardiovascular health. Eleuthero extract helps to support the adrenal gland, improve mental and physical performance and strengthen the immune system. Nicknamed the "vision herb," Bilberry extract has a substantial body of research supporting its claim to benefit the eyes. Vitamins A, C, D2, E, K and B Complex. These nutrients make this formula unsurpassed for its ability to promote a healthy functioning body. 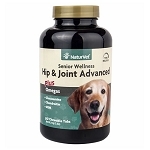 For optimal health during your dog's golden years, give him the most potent nutritional support available. Canine Geriatric Basics is hypoallergenic and contains human-grade ingredients so that your best friend can live a long and healthy life. I have been giving my 8 1/2 year old Samoyed these vitamins for the past couple of years and wow what difference they have made in his overall health. I cook his food for him daily because he's such a picky eater and wanted to be sure that he was getting all of the appropriate vitamins and minerals etc. in his diet. Between eating a 100% quality human food diet and taking Thorne supplements he is the picture of health! Thank you Thorne Research for selling such quality products! We have been very pleased with the quality and effectiveness of Thorne products for our pets. First recommended by our Vet. For our two geriatric dogs we've been using Hepagen-C, Arthroplex and Geriatric Basics with good results. Vitamin C (Ascorbic Acid) - 62 mg.
Vitamin E (d-Alpha Tocopheryl) (50 IU.) - 41.3 mg.
Ashwagandha extract - 25 mg.
Bilberry extract (Vaccinium myrtillus) - 15 mg.
Coenzyme Q-10 - 15 mg.
Calcium Pantothenate (Vitamin B5) - 10 mg.
Mixed Bioflavonoids - 10 mg.
Riboflavin 5'-Phosphate Sodium (Vtamin B2) - 10 mg.
Thiamin HCl (Vitamin B1) - 10 mg.
Pyridoxal 5'-Phosphate (Vitamin B6) - 7 mg.
Phosphatidylserine Isolate - 6.2 mg.
Alpha-Lipoic Acid - 5 mg.
Eleuthero extract (root) - 5 mg.
Choline Citrate - 5 mg.
Niacin (Vitamin B3) - 3 mg. Beta Carotene (1,000 IU) - 600 mcg. Zinc (Picolinate) - 500 mcg. Chromium (Chelidamate Arginate) - 20 mcg. Iodine (Potassium Iodide) - 10 mcg. Methylcobalamin (Vitamin B12) - 10 mcg. Vitamin K1 - 5 mcg. Vitamin D3 (75 IU.) - 1.9 mcg. Inactive Ingredients: Hypromellose (derived from cellulose) capsule, Microcrystalline Cellulose, Leucine, Silicon Dioxide.